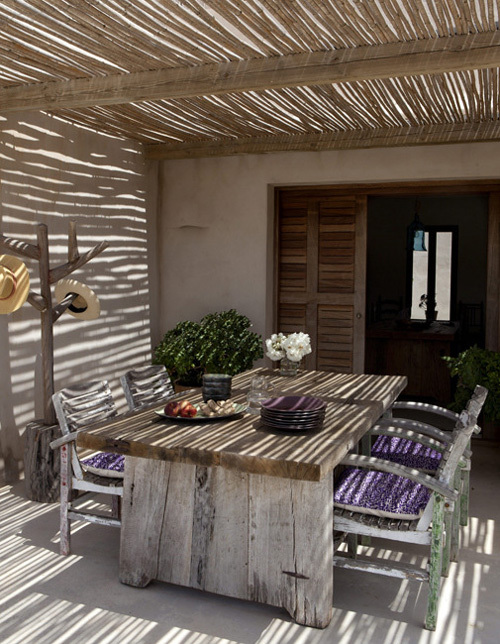 Today another one of my favourite summer houses, also located on Formentera, Spain. It belongs to Eugenia, who works as a fashion model but she could also be an interior decorator. She did a fantastic job decorating this fabulous place. 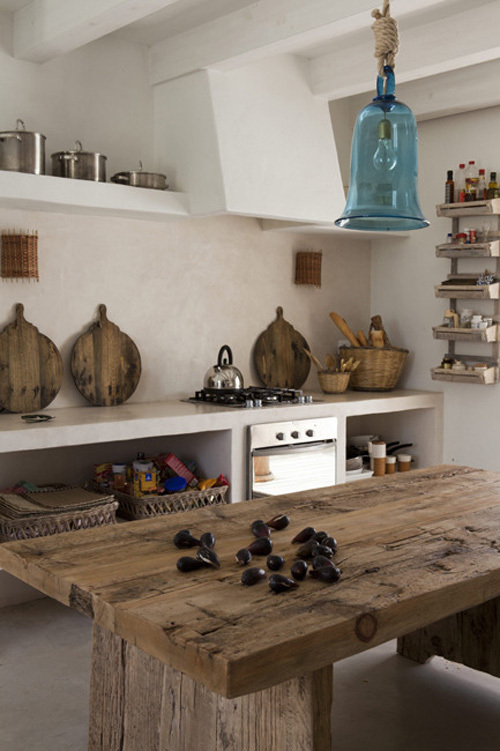 Isn’t this kitchen with gorgeous wooden table to die for?! I love the rustic vibe. The rug, the pillows in various patterns and colors, the wooden furniture … everything fits perfectly. 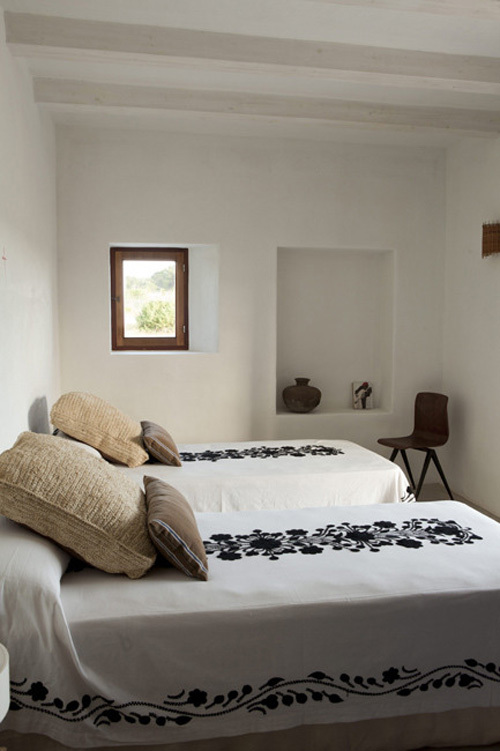 The bedroom has a serene atmosphere, with beautiful black and white bedspreads. The outdoor areas (image below + top image) are perfect for outdoor eating and relaxing. I could picture myself there zipping from a cocktail! Hi, wow what a place! Could see my self living here =) Have a great day! As casas de Ibiza são sempre especiais e simples! adoro! The houses of Ibiza are always special and simple! love it! It’s the house of the spanish model Eugenia Silva. You can read more at http://www.formenteraguamarina.com/2010/06/el-summummmmcan-eu.html. Love you site! Love formentera. Love this house. Perfectly styled. All it needs is me poolside drink in hand. This looks wonderful! Looks so calming! The exterior looks pretty good, too. Wish there were more exterior shots! 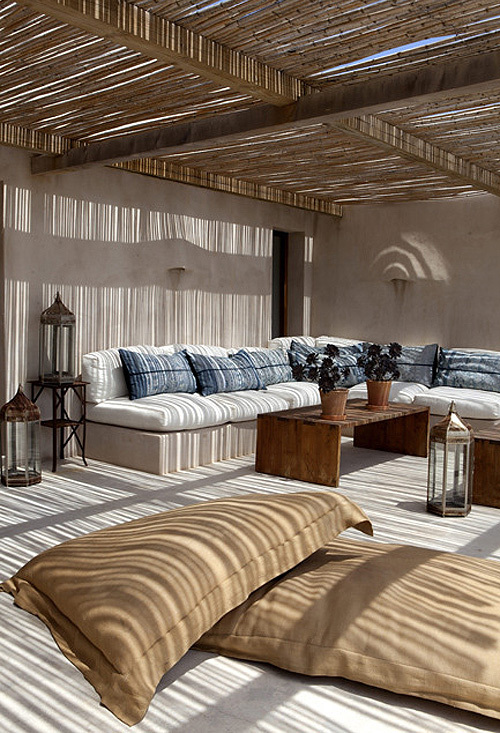 these summer homes always reminds me Brabbu pieces. and also reminds me that i need vacations! Please can you add to the Ricardo Labougle copyright story about “Eugenia Silva in Formentera” this copyright : Ana cardinale; i remember that I am the producer and the writer of the story. Where can I find these beautiful black and white bedspreads?